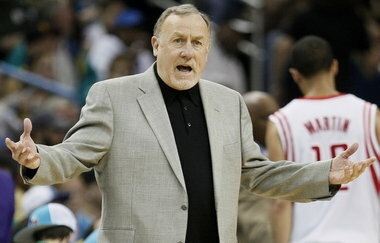 Did you enjoy Rick Adelman's tenure with the Rockets? Discussion in 'Houston Rockets: Game Action & Roster Moves' started by tinman, Mar 21, 2014. Did you like Rick ? Let me ask you this, what did Rick lead the Rockets to in his years here? Did Rick have a positive win percentage as Rockets' coach? The truth hurts. But, real Rockets fans have to regulate from time to time. btw...hit reply to this post and cut and post my image code into your OP. It will fix the picture being too large. We almost beat the champion, that's a very big thing to me. Kobe has more will to win than tmac. Daryl Morey recognized that and noted in the future he will find a star player with heart and will to win. He did that, thank you Morey for getting Harden. 2009-10 and 2010-11, i LOVED those seasons. Brooks, Dragic, Scola, Lowry, Martin, Hayes, Lee, Budinger, Ariza, Landry, Dalembert.... so many fun players and awesome moments from a scrappy overachieving team. I don't know if it's amazing or sad that Rick Adelman's teams throughout his coaching career are always just a few victories away from beating teams that Phil Jackson eventually leads to the title. It was fun, yeah. The teams he had were injury-riddled but I can't really fault that to Rick's coaching. The only thing that frustrated me the most about him is his infatuation with Brad Miller. Absolutely! T-Mac and Adelman were a legendary duo for sure! Another "look at me" thread by butthurt tinman. I absolutely did, but I also thought it was time for him to go. He was a great coach for a Yao-Ming centered team - once Yao was gone, he wasn't such an asset and the defense went to hell exactly as you'd predict if you understood Rick's history and Yao's importance. The Rockets are currently on the longest streak of winning seasons in franchise history. RA was a big part of that because he kept the team at least a little competitive in the middle of a really rough transition from the Yao-McGrady era. So I was positive about him as a coach but agreed with not bringing him back. Almost? Getting blown out in 4 road games isn't almost. Clutch needs to do something about people who post false stats. I was fine with RA as coach. I don't think he was the greatest nor the worst. Biggest issue I had with him was the way the T-mac situation went down. Not saying RA wasn't within his right to handle it as he saw fit..but we all know that JVG and T-mac had a much better relationship and a lot of the drama would have been avoided. Other than that, I think he was a fine coach. Probably we should have let him go once the Yao-Mac era was over and blown-up the team then and there. Those 2 years of just being in no-man's land was not fun at all. Still, the 22 game winning streak was a thing of beauty. Maybe a statistical fluke, but you have to give RA some credit for having that with two superstars who couldn't seem to stay healthy. I think if he had a healthy Yao-Mac and guys like Lowry, Scola, Brooks, Battier, and company all healthy at once he would have been able to make a deep run into the playoffs. Adelman should be coaching the Lakers right now, I still have no idea how or why Dantoni landed in LA and Adelman ended up in Minny. Does James Harden secretly enjoy torching other NBA Adidas sponsored players?